You need to use your shower! I don’t mean to imply that you must go take a bath; I’m only suggesting you use your shower when you aren’t using it. 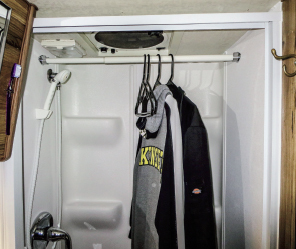 You have to admit, most RV showers are wasted space when you’re not bathing. 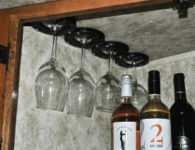 But you can reclaim that wasted space with the addition of a closet rod. Measure the inside width of your shower walls. Go to a local home improvement store, such as Lowe’s or Home Depot, and purchase two rod holders (or support brack-ets) and an expandable closet rod that will fit wall-to-wall inside your shower. 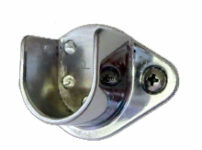 Attach the rod hangers high up on opposite walls and slip the rod into place. Now you have an excellent place to hang towels to dry. The rod lifts out easily when you want to shower. You can also use them for hanging clothes and free-ing up space in your closet. It’s a great place to hang wet raincoats and umbrellas to drip dry, too. Average Street Price: $10-$20 at any home improvement store.